Light duty roto tiller for small gardens. Also, can be used in orchards or nurseries. The MZ2 is for the 15 to 18 HP tractors. Available in 34" and 42". 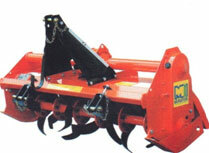 Roto tiller for cultivation of any kind of soil. Thanks to its extraordinary stoutness this machine is suitable for any kind of middle to low powered tractors. Available in 46", 50", 58" and 64". Medium duty roto tiller, able to work any kind of soil, with little power absorption. Side chain drive, extremely versatile and slip clutch protection is standard. Available in 66" and 74" widths. Heavy duty roto tiller, able to work any kind of soil, with little power absorption. Side chain drive, extremely versatile and slip clutch protection is standard. Available in 81" width.